OXFORD, 18 August 2016 - Researchers from the University of Oxford’s Bodleian Libraries and from universities in the Netherlands have used high-tech imaging to uncover the details of a rare Mexican codex dating from before the colonization of the Americas. The newly revealed codex, or book, has been hidden from view for almost 500 years, concealed beneath a layer of plaster and chalk on the back of a later manuscript known as the Codex Selden, which is housed at the Bodleian Libraries. Scientists have used hyperspectral imaging to reveal pictographic scenes from this remarkable document and have published their findings in the Journal of Archaeology: Reports. ‘After four or five years of trying different techniques, we’ve been able to reveal an abundance of images without damaging this extremely vulnerable item. We can confirm that Codex Selden is indeed a palimpsest,’ said Ludo Snijders from Leiden University, who conducted the research with David Howell from the Bodleian Libraries and Tim Zaman from the University of Delft. 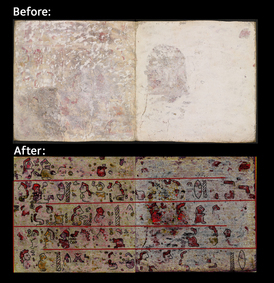 This is the first time an early Mexican codex has been proven to be a palimpsest. ‘What’s interesting is that the text we’ve found doesn’t match that of other early Mixtec manuscripts. The genealogy we see appears to be unique, which means it may prove invaluable for the interpretation of archaeological remains from southern Mexico,’ Snijders said. The imaging has also revealed a prominent individual who appears repeatedly on the document and is represented by a large glyph consisting of a twisted cord and a flint knife. The name seems to resemble a character found in other Mexican codices: the Codex Bodley (in the Bodleian’s collection) and Codex Zouche-Nuttall (in the British Museum).That character is an important ancestor of two lineages connected to the important archaeological sites of Zaachila and Teozacualco in Mexico. However, further analysis is needed to confirm that it is the same individual. Working with the Humanities Division in the University of Oxford, the Libraries acquired the hyperspectral scanner in 2014 with the support of the University’s Fell Fund. Once a technique used by astrophysicists to study the colour of stars, hyperspectral imaging is now used by Bodleian researchers to reveal hidden text and images and identify unknown substances and pigments with a high degree of accuracy. Researchers have recently used the scanner to clarify the text of the famous Bakhshali manuscript from India, which includes the first use of zero, to analyse the medieval Gough Map, the earliest road map of Great Britain and to reveal a hidden devil in a centuries-old Armenian gospel-book.